For 16 seasons The Simpsons; the sharpest, most biting satire ever unleashed outside the underground and splashed onto the global mainstream, has managed to affect the cultural landscape while simultaneously ripping its fabric to hilarious shreds. It is the most subversive kind of art, sprung from the very medium it attacks, gaining the popularity and relevance of an international icon, while also being its most uncompromising critic. For a mere TV show, a cartoon one at that, it is unique in its construct, dissemination, and finally its vast and varied audience, which include poet laureates to head’s of state, rock stars, and scores of professors from the loftiest heights of academia. So now finally we have a study of its brilliance and influence worthy of the subject. It is a 400-plus page tribute, dissection, and investigation entitled “Planet Simpson – How A Cartoon Masterpiece Defined A Generation” by Canadian journalist and pop culture essayist, Chris Turner. Someone had to do it, and for all true fans of what could be deemed (as many critique circles already have) the best show in television history, it would appear the right man for the job did. From The Simpsons’ heralded and over hyped infancy to its Golden Age of the early to mid-90s’, which Turner calls “an awesome achievement in pop art”, all the way through its incredible level of consistency in writing, voice-acting, production, and direction, “Planet Simpson” expertly reviews and defines the longest running prime time television comedy by leaving no philosophical or cultural query unturned. Turner’s astoundingly encyclopedic research on the hundreds of episodes and thousands of key moments pleases the discerning fan while also deftly presenting the show’s highlights for the novice. The best compliment for any book of this ambition would be that it serves as a practical explanation for why we all love The Simpsons as much as we do, and “Planet Simpson” does this in spades. It is the most subversive kind of art, sprung from the very medium it attacks, gaining the popularity and relevance of an international icon, while also being its most uncompromising critic. ” riffs; the false assumption that it’s human nature to base our judgments of the world at large on “what should be” like God, country, principle, morality, and open, selfless dedication to each other and our environment, an almost superman vision of society. The “What is…” is the actual maddening complexity of human nature filled with greed, insolence, power-struggle, jealousy and pettiness. According to Bruce, and the best The Simpsons have to offer, by ignoring the imperfections and fears of our world and replacing them with rose-colored fallacies we create the framework for disappointment and disillusionment. From here “Planet Simpson” takes off in several provocative directions, highlighted by Turner’s strong grasp of the socio-political landscape of the world that The Simpsons draw material from weekly. Whether it is a study of the consumerism lunacy of 90s’ America, the power of corporate tentacles throughout the civilized world, or our silly obsession with celebrity, Turner tells us where and how and why The Simpsons seem to have it nailed and consistently get away with pushing an envelope other art forms wish they could touch. 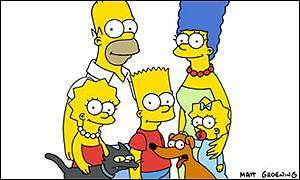 Turner agrees with Simpsons’ creators like Matt Groening and Sam Simon who have stated that because of the two-dimensional façade of a cartoon, much more is accepted and allows for the writers a greater palate with less limitations. The book cleverly breaks down The Simpsons’ family members into defining chapters, encapsulating their individual and collective luster and why they have resonated under the satirical umbrella of “what is” so effectively for so long: Homer; goofy, lovable father or gluttonous, consumer-addled hedonist? Bart; misguided imp or rebellious punk icon? Lisa; smart, compassionate voice of reason or pompous intellectual finger-pointer? Marge; the show’s patient moral center or enabling nag-victim? Each character is studied for its reflection of human nature and how their image has represented us hilariously and so vividly without apology for the show’s incredible run. Then, of course, there is Springfield, U.S.A. and its inhabitants, which run the gamut of society’s ills and thrills from politics in the overtly slimy Mayor Quimby; “I propose that I use what’s, uh, left of the town treasury to move to a more prosperous town and run for mayor. And, uh, once elected, I will send for the rest of you” to organized religion in the blatantly judgmental Reverend Lovejoy; “And as we pass the collection plate, please give as if the person next to you was watching” to corrupt attorneys in the dangerously inept Lionel Hutz; “Mr. Simpson, this is the most blatant case of fraudulent advertising since my suit against the film, ‘The Never-Ending Story'” to our mediocre crop of educators in the overwhelmed Principle Skinner, “God bless the man who invented permission slips”.